The cathedral of Notre Dame is one of the most historic buildings in the world. The recent fire is a devastating blow both to the culture of France and the world. As well as being a center of religious worship, Notre Dame has had its brush with wars as well. On December 16, 1431, King Henry IV of England was crowned as King of France in Notre Dame. He was aged only ten years old at the time. 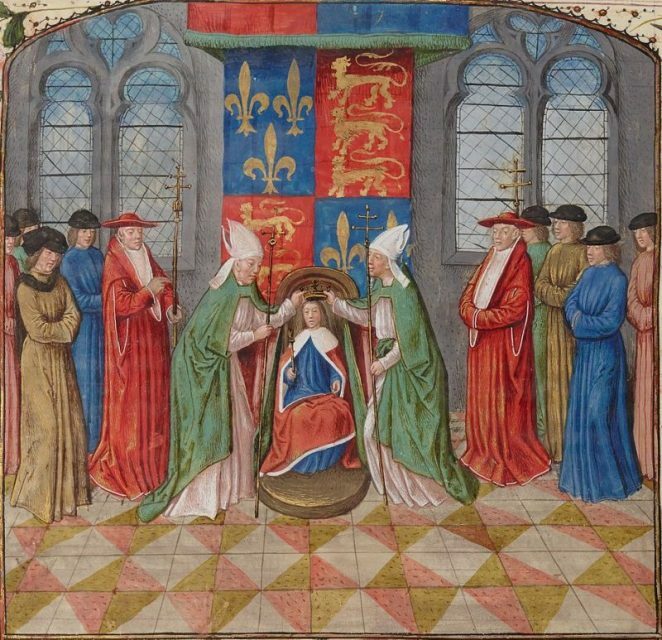 King Henry VI of England is crowned as King of France in Notre Dame on December 16, 1431. This crowning was part of the Hundred Years War which ran from 1337 to 1453. The conflict saw the House of Plantagenet in England pitched against the House of Valois in France, both sides vying for the right to rule France. The Hundred Years war involved five generations of kings, and its roots lay in the fact that English kings in Norman times had been French and so had held land and titles in France. No doubt Henry IV saw his coronation at Notre Dame to be literally “a crowning glory,” although his reign as King of France was to be very short. 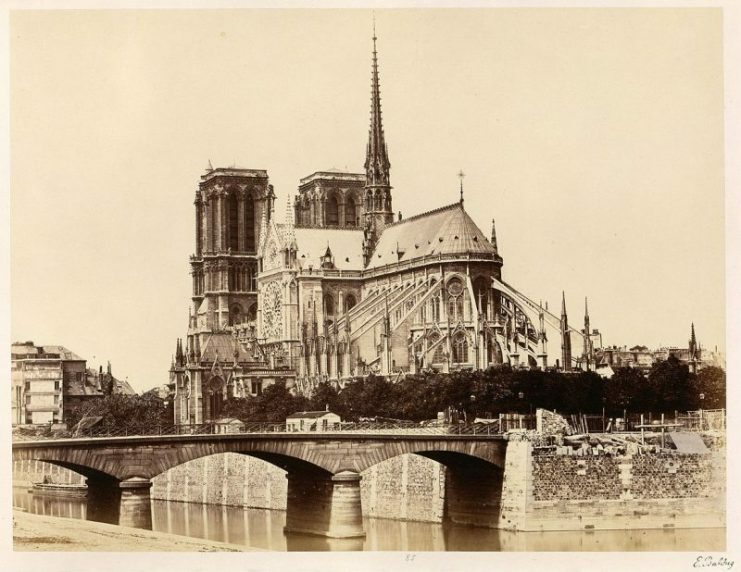 East facade of Notre-Dame in the 1860s. News outlets have reported that some of the treasures held in Notre Dame have thankfully been saved. Allegedly, a human chain including firefighters and priests was formed to help remove religious relics housed in the cathedral. Included among the rescued treasures (at the time of writing) were the Crown of Thorns and the Blessed Sacrament. It is sincerely hoped that as many moveable treasures as possible have been rescued from the flames. However, one item which will have had to withstand the flames is the war memorial tablet on the wall of Notre Dame. 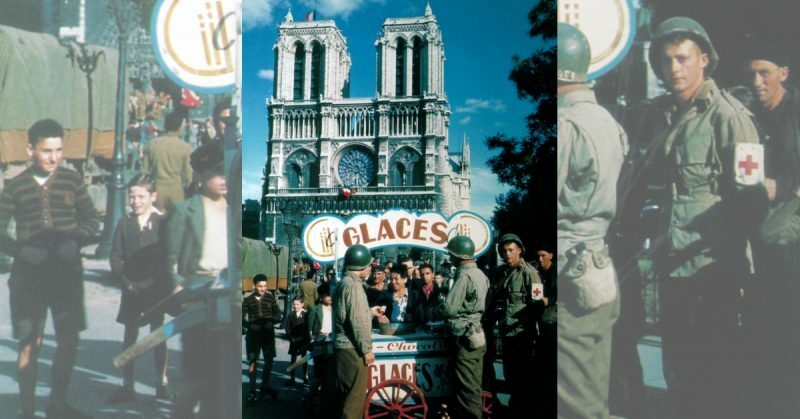 Notre Dame in Paris, 1945. The principal function of the Imperial War Graves Commission is to mark, record, and maintain military graves and places of commemoration. Between 1923 and 1936, the Commission worked hard to create and erect war memorials in French and Belgium cathedrals. These memorials took the form of plaques fixed on the wall and were to commemorate those people from the British Empire who lost their lives during the First World War. 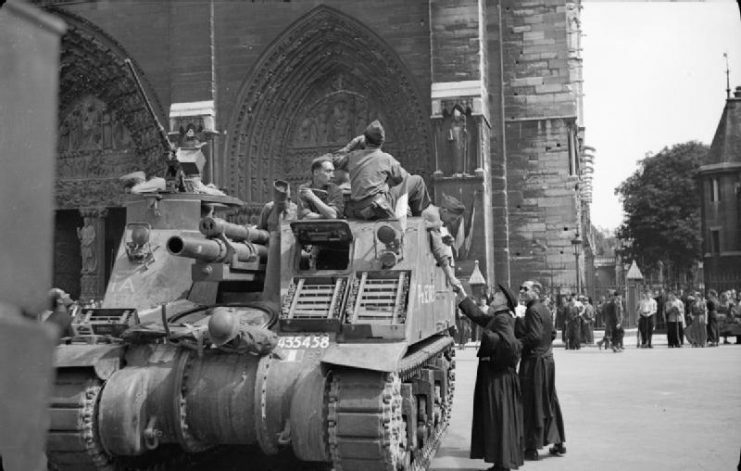 Priest 105mm self-propelled guns of the French 2nd Armoured Division in front of Notre Dame in Paris, 26 August 1944. 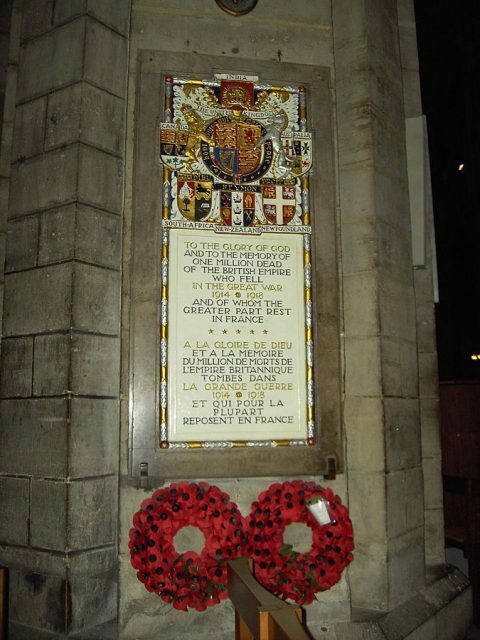 The cathedrals chosen to house such memorials were those in cities where troops from the British Army or Empire had been stationed during World War 1. Naturally, there had to be a memorial in Paris. The Notre Dame tablet was unveiled on July 7, 1924, by the Prince of Wales who was the President of the War Graves Commission and who would, ultimately, become King Edward VIII of England. 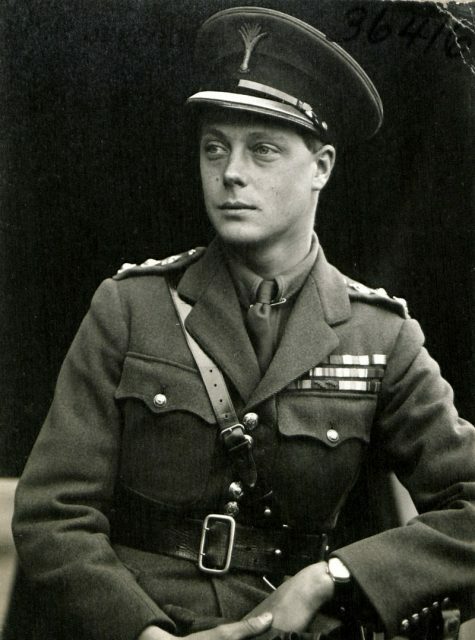 Caption: Edward VIII when he was the Prince of Wales in the uniform of a colonel of the Welsh Guards, 1919. 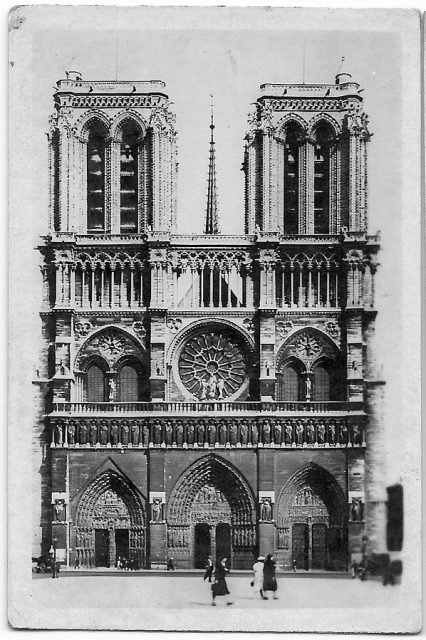 While other tablets erected in France had the same or similar design and inscription, the Notre Dame memorial was the first standard one to be installed and has particular significance. Notre Dame cathedral has ten bells which have rung out to mark significant world events, such as the end of wars. 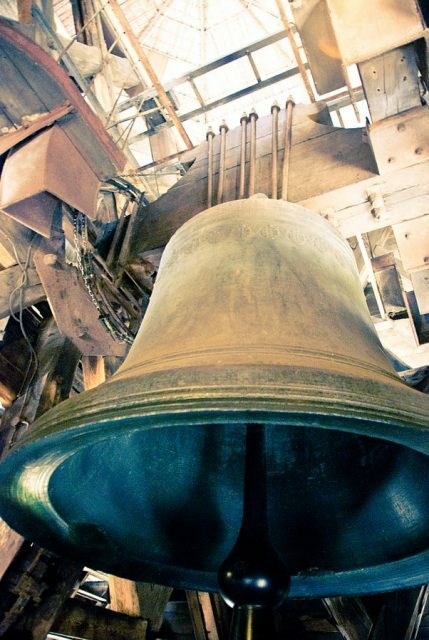 The heaviest of bells belonging to a musical instrument (and the one which produces the lowest note) is called the “bourdon.” Notre Dame’s bourdon was named Emmanuel by King Louis XIV. It is tuned to F sharp and has been rung to mark a variety of major events from the coronation of French kings to the end of World War 1 and World War 2. Bell of Notre Dame: The Emmanuel bell of Notre Dame which was rung to signal the end of World War 1 and World War 2. It is held by musicians and bell ringers alike to be one of the most beautiful bells in the world. It was saved from the destruction of the French revolution, and we can only hope that a bell that has announced such momentous incidents as the end of wars will survive the flames. Notre Dame has stood as a witness to many world events. It has hosted the crowning of kings. Its bells have rung out the end of wars. 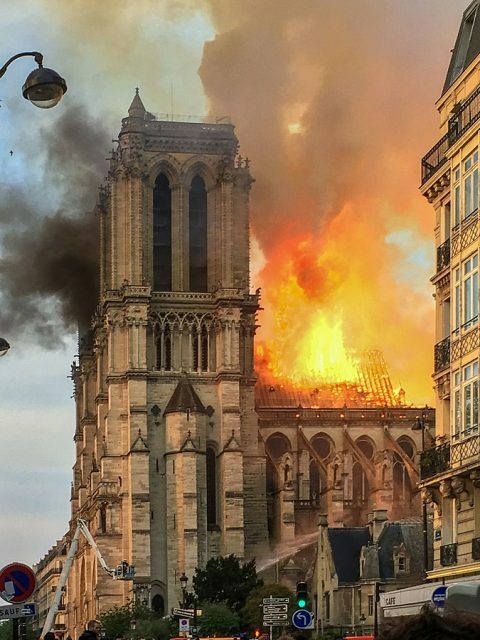 And, even though other War Grave tablets exist, the loss of the Notre Dame tablet would be another sliver of heartbreak caused by the terrible fire in Paris.